Chosen for "The Best Children's Books of the Year " by Children's Book Committee at Bank Street College of Education. This book is also available as an e-book and as a recorded book. Superior writing and appeal for both students and teachers. The United States is at war with Germany. Fourteen-year-old Jill Winter’s mother is traveling to Newfoundland to be with Jill’s sick uncle. She must pass through the treacherous North Atlantic where German submarines – U-boats – stalk like wolves. Jill’s father, a famous pop singer, is on tour, so Jill is sent to Winter Haven, Maine, to stay with Nana. Quarry, a local boy, says that “gossip ain’t never been so good,” and Jill soon discovers he’s right – Winter Haven is full of secrets and rumors. First there’s Wendy, a teenager who’s visiting her aunt Adrie, the owner of a local inn, and who tells so many fanciful stories and secrets, it’s hard to know what’s true. Then there are the Crystals, a snobbish girls’ club, who blackball Wendy because of a dark secret they reveal to Jill. Even Nana seems to be keeping secrets – with her German friend Ida Wilmar! Who’s a friend and who’s an enemy? As German subs torpedo American and Canadian ships off the Maine coast, Jill is anxious for her mother’s safety. Her fears are heightened when she finds a wounded pigeon with the message Sonnabend iv attached to its leg! When Nana and Ida Wilmar whisper to each other and Jill hears that same word – Sonnabend – she determines to uncover the truth behind the mysteries in Winter Haven. But she soon finds herself in grave danger when she uncovers the biggest secret of all – and must run for her life! Based on startling historical events that took place in the harbors of Maine during World War II, Shadows on the Sea is a fast-paced mystery that will keep readers guessing from beginning to end. Shadows on the Sea is a remarkable book. 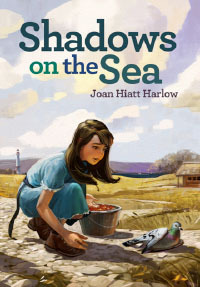 Joan Hiatt Harlow, the author, is a magnificent writer. I didn't want the book to end. I thought it was really cool that the conflict was here in Maine. The conflict was a girl named Jill came to Maine to visit her Nana during World War II. Jill wanted to go either with her mother who went to Newfoundland to be with her ill brother or Jill wanted to got with her dad, a famous singer, on his tour around the United States, but both her parents thought it was too dangerous because of the war. So Jill was sent to visit her Nana in Winter Haven, Maine. A town that isn't as safe as everyone thinks. When Jill went up onto the Widow's Walk, a place on top of your house where sailor's wives would wait for their husbands to return home, she could see German U-Boat shadows on the sea and flames from torpedoed ships. Then Jill found a carrier pigeon on the porch that Sarge, the cat, had found. It had a German message attached to its leg. All this told Jill that the war was very close, closer than she might have thought. From the carrier pigeon clue Jill thought Clayton Bishop was helping the Germans in this war because he raised pigeons and she was right. Clayton and Adrie, the owner of the Tea Room Inn, were helping the Germans. Jill found out that Clayton and Adrie were helping the Germans when she was walking past Clayton's house and heard German voices coming from his backyard so she started spying on Clayton and Adrie. Clayton and Adrie walked down to the sea where a German U-Boat arose from the water and two Germans came out of the U-Boat. The four adults started walking back to the street so Jill decided to go home and tell the police, but then Adrie spotted Jill and told Clayton, who chased Jill home and locked her up on the Widow's Walk. When Nana got home from her meeting she found Jill, got the police and Jill told them everything. The FBI tracked down Clayton and Adrie and then everyone was safe. I really enjoyed this book. It was a thrill to read! I wanted the book to never end. I would definitely recommend this book to someone else.